National Snaffle Bit Association - The September Issue of The Way To Go is now Online! The September issue of The Way To Go is Now Online! Bonnie Sheren proves it is never too late to follow your dreams. 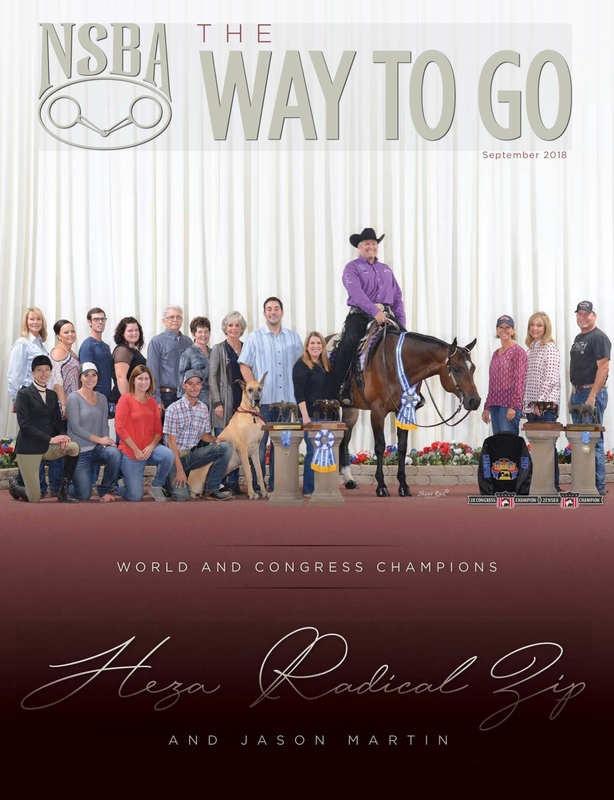 Her horse, Heza Radical Zip, and trainer Jason Martin grace this month’s cover, and the Cover Story chronicles how Bonnie has risen to the top of the industry in six short years, in two of the most complicated disciplines in the pleasure horse pen. In this special focus on the color horse industry, we also look at how color breed associations and color breed classes are expanding. Officers of the Ohio Quarter Horse Association received a surprise President’s Award from NSBA President Susie Johns for the All American Quarter Horse Congress. The Way To Go looks at the many ways the Congress has been a long-time friend of NSBA. Stephanie Lynn talks about stepping outside your comfort zone to achieve greater success in this month’s Sound Advice. The September issue recaps NSBA’s successful Boot Camps, and looks ahead to the start of bidding for Trainer and Stallion Services on October 1. A number of color breed association world championship shows were held over the past few months, and a summary of the NSBA champions can be found. All this and more in the September issue of The Way To Go!